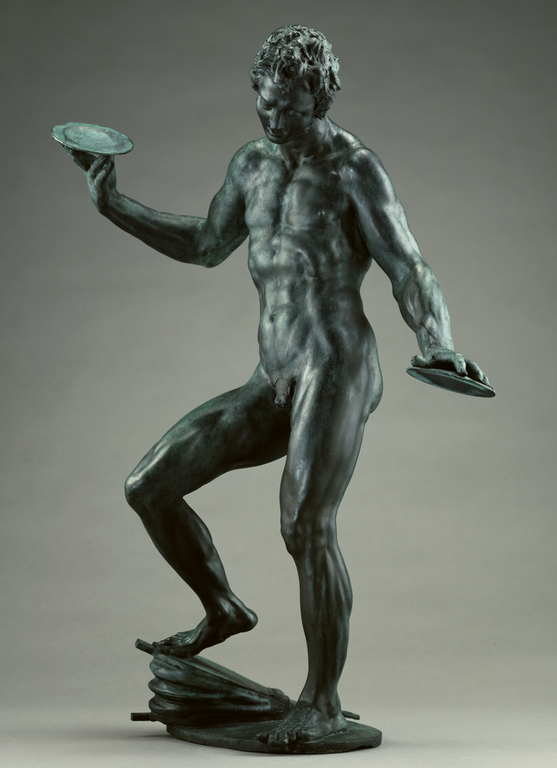 At a crucial moment in an acrobatic juggling trick, this male figure holds one plate perched precariously on the fingertips of his right hand while another plate, held by centrifugal force, seems suspended. Further complicating the pose, the man looks at the ground and steps on a bellows. 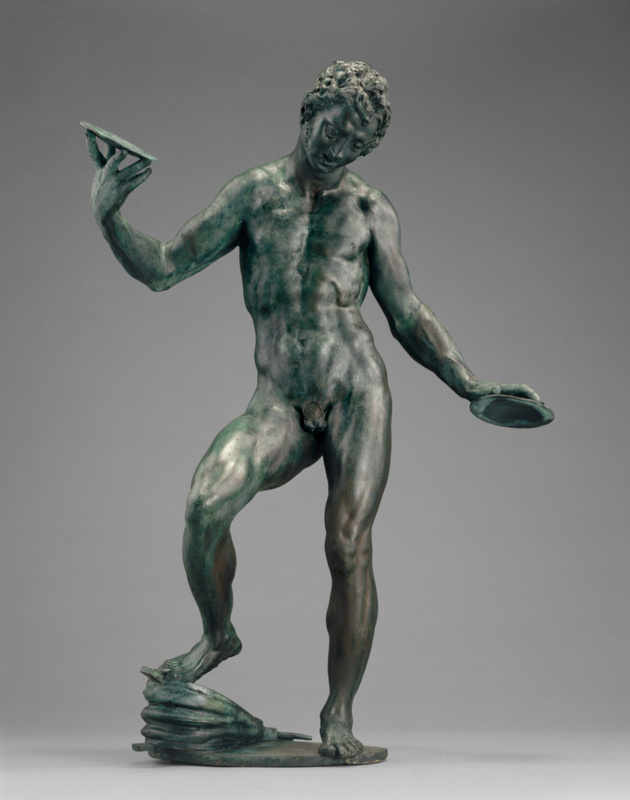 Dutch artist Adriaen de Vries based the composition of this bronze statue on a famous Hellenistic marble of a dancing faun, which Michelangelo was believed to have restored while it was in the collection of the Medici in Florence. 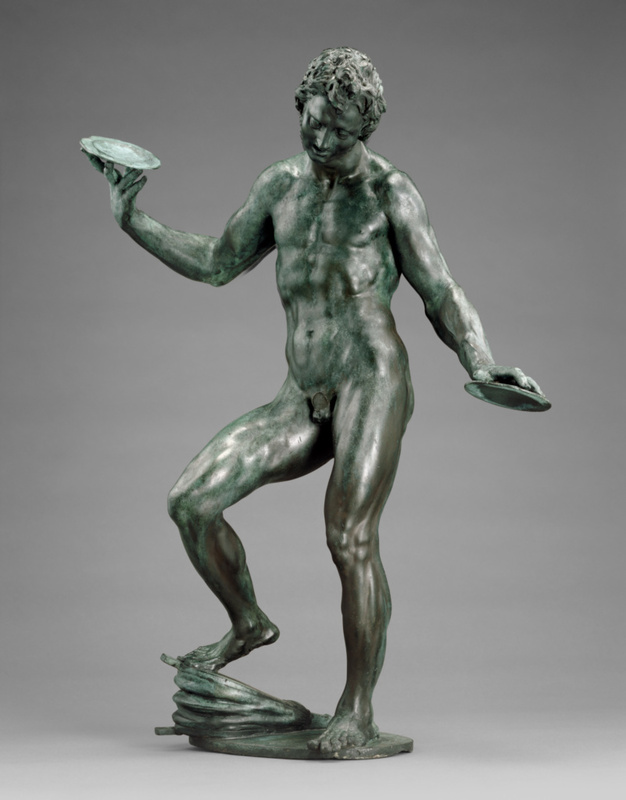 Although de Vries borrowed the original statue's composition, he replaced the faun's foot organ with a bellows and substituted plates for the faun's cymbals. This work of artistic virtuosity combines vitality and movement with balance. 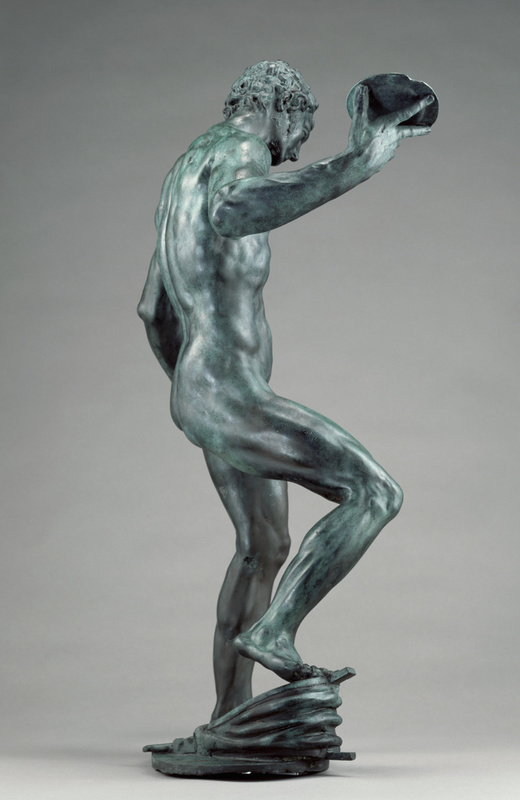 The strong S-curve of the figure's back demonstrates the complexity of his balancing act. The artist may also have had in mind the German word kunststückemachen, which means both to juggle and, more literally, to make a work of art. The use of a verbal conceit such as this one and the exploration of a figure moving in space are characteristic of the Baroque style. Cyril Humphris, S.A., sold to the J. Paul Getty Museum, 1990. Sotheby's, London. European Works of Art and Sculpture. December 7, 1989, pp. 34-38, lot 65, ill.
Sotheby's, Sussex. Garden Statuary and Architectural Items. May 30-31, 1989, p. 121, lot 455, ill.
Larsson, Lars Olof. "Adrien de Vries and Rudolfean Court Sculpture." Sotheby's Art at Auction 1989-90 (1990), pp. 296-97, 302, fig. 1. "Acquisitions/1990." The J. Paul Getty Museum Journal 19 (1991), p. 166, no. 60, ill.
Luijten, Ger, et al., eds. Dawn of the Golden Age: Northern Netherlandish Art, 1580-1620, exh. cat. (Amsterdam: Rijksmuseum, with Waanders, 1993), pp. 67, 69, fig. 102. Avery, Charles. Renaissance & Baroque Bronzes in the Frick Art Museum, exh. cat. (Pittsburgh: The Frick Art & Historical Center, 1993), pp. 126, 128, under no. 38, fig. 38.2. Binnebeke, Emile van. Bronssculptuur: Beeldhouwkunst 1500-1800 in de Collectie van het Museum Boymans-van Beuningen / Bronze Sculpture: Sculpture from 1500-1800 in the Collection of the Boymans-van Beuningen Museum. (Rotterdam: Museum Boymans-van Beuningen, 1994), pp. 98-99, under no. 24. Christie's, London. Important European Sculpture and Works of Art. July 4, 1995, p. 54, under lot 98. The J. Paul Getty Museum Handbook of the Collections. 4th ed. (Los Angeles: J. Paul Getty Museum, 1997), pp. 252-53, ill.
Fusco, Peter. Summary Catalogue of European Sculpture in the J. Paul Getty Museum (Los Angeles: J. Paul Getty Museum, 1997), p. 55, ill.
Fusco, Peter, Peggy Anne Fogelman, and Marietta Cambareri. Masterpieces of the J. Paul Getty Museum: European Sculpture (Los Angeles: J. Paul Getty Museum, 1998), pp. 48-51, no. 15, ill., entry by Peggy Anne Fogelman. Scholten, Frits, et al. Adriaen de Vries, 1556-1626: Imperial Sculptor, exh. cat. (Amsterdam: Rijksmuseum, with Waanders, 1998), pp. 34, 55, 65, 67, 69, 99, 201-5, no. 32, ill., entry by Frits Scholten. Diemer, Dorothea. "Adriaen de Vries: Neue Forschungen und eine bedeutende Ausstellung." Kunstchronik 52, no. 6 (June 1999), pp. 256-58, fig. 10. Hecht, Peter. Gelukkige momenten en gemiste kansen (Amsterdam: Vereniging Rembrandt, 2000), pp. 36-37, fig. 12. Berger, Ursel, et al. Adriaen de Vries 1556-1626: Augsburgs Glanz - Europas Ruhm, exh. cat. (Augsburg: Städtische Kunstsammlungen, with Umschau Braus, 2000), pp. 36, 69-70, 91, 266-69, no. 24, ill., entry by Frits Scholten. The J. Paul Getty Museum Handbook of the Collections. 6th ed. (Los Angeles: J. Paul Getty Museum, 2001), pp. 252-53, ill.
Slive, Seymour. "Collecting 17th-Century Dutch Art in the United States: The Current Boom." Bulletin van het Rijksmuseum 49, no. 1 (2001), p. 89, fig. 8. Smith, Pamela H. The Body of the Artisan: Art and Experience in the Scientific Revolution (Chicago and London: The University of Chicago Press, 2004), pp. 108-9, fig. 3.5. The J. Paul Getty Museum Handbook of the Collections. 7th ed. (Los Angeles: J. Paul Getty Museum, 2007), pp. 198-99, ill.
Bassett, Jane, et al. 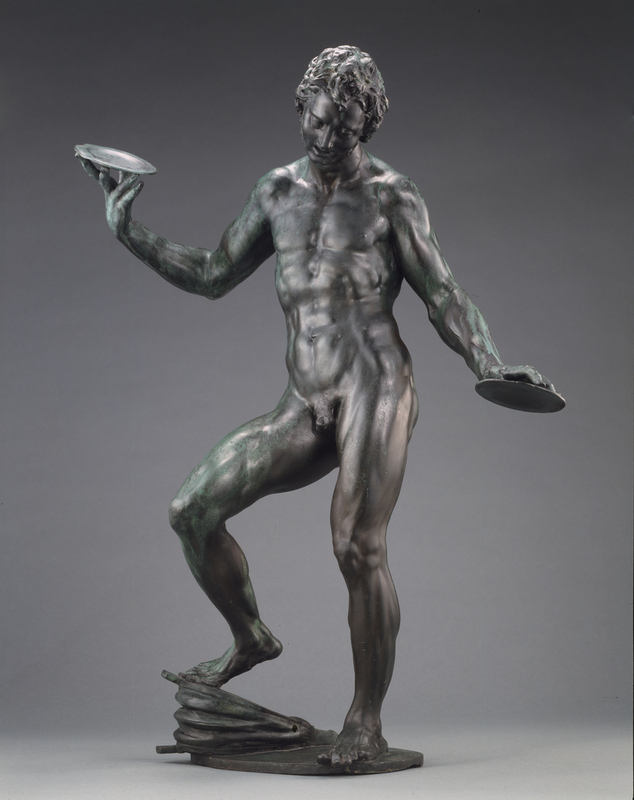 The Craftsman Revealed: Adriaen de Vries; Sculptor in Bronze (Los Angeles: The Getty Conservation Institute, 2008), pp. xi, xiii-xiv, 24, 30, 39, 150-57, 262, 265, 267, 271, 273, 290, figs. 19.1-9, cover ill.
Bassett, Jane. "Adriaen de Vries, Master Craftsman: Aspects of the Artist's Technique." In Neue Beiträge zu Adriaen de Vries: Vorträge des Adriaen de Vries Symposiums vom 16. bis 18. April 2008 in Stadthagen und Bückeburg. Sigmund Graf Adelmann, and Dorothea Diemer, eds. (Bielefeld: Verlag für Regionalgeschichte, 2008), pp. 196-97, fig. 140. Scott, David A. Ancient Metals: Microstructure and Metallurgy (Los Angeles: Conservation Science Press, 2011), vol. 1, pp. 153-55, figs. 9.58-9.61. Habetzeder, Julia. "Den ofrivillige cymbalspelaren: en satyrskulpturs genomslag i tid och rum." In Okonstlad konst? Om äkthet och autenticitet i estetisk teori och praktik. Axel Englund and Anna Jörgården, eds. (Lindome: Brutus Östlings Bokförlag Symposion, 2011), pp. 92-93, fig. 5. The J. Paul Getty Museum Handbook of the Collections. 8th ed. (Los Angeles: J. Paul Getty Museum, 2015), p. 246, ill.
Curriculum addressing the science of art production, conservation, and scholarship using the Getty’s artworks and conservation practices.